Ryan Betts, Cloud Solutions Architect: FIM 2010 R2 SP1: Installing FIM Password Portal and FIM Reporting "The SharePoint 2010 Administration Service is not running. Please start it and then click "Retry". Click "Cancel" to abort setup." 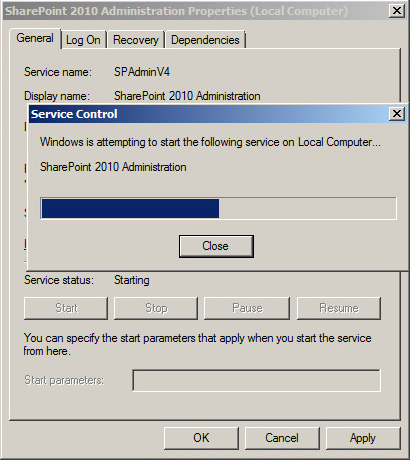 FIM 2010 R2 SP1: Installing FIM Password Portal and FIM Reporting "The SharePoint 2010 Administration Service is not running. Please start it and then click "Retry". Click "Cancel" to abort setup." 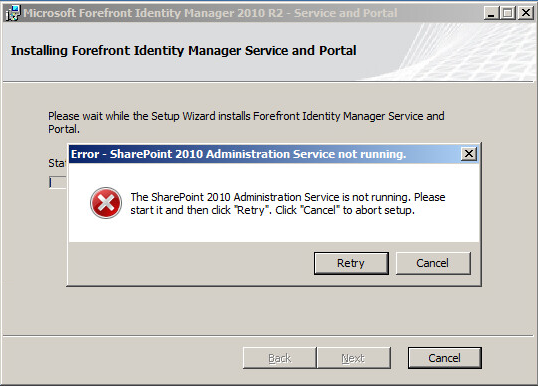 After going through the massively complex installation process of Forefront Identity Manager Installation wizard for the Password Reset portal and the Reporting Services components you receive the following error "The SharePoint 2010 Administration Service is not running. Please start it and then click "Retry". Click "Cancel" to abort setup." it's pretty self-explanatory as an error. Basically the SharePoint 2010 Adaministration Service is not running on the SharePoint Server (which in this case also the FIM server). I had forgot to reconfigure the SharePoint 2010 Administration (or SPAdminV4) service to start Automatically, I did the manually from the services.msc MMC. After this I clicked Retry and the setup continued.